Greetings right before Memorial Day, guys! The library will be closed that day, so I wanted to recommend something before then. Sometimes I go and find a book I've read before and tell you about it. I call these Blasts From the Past and I've got a good one today. It's Heart of a Shepherd by Roseanne Parry, which I read way back in 2009 and it has stuck with me all these years. (you could read my original review here) This is a remarkable story, all about what a 12-year-old boy goes through when his dad is deployed to Iraq (that war was in full swing when this was written), his older brothers go off to college or the army and he has to run the family ranch with his grandparents. This is realistic fiction, which means there are no swordsmen or magicians, no powerful families running worldwide conspiracies and no spaceships outrunning Imperial cruisers. But it is all about real-world real problems faced by a real-world boy. The library has plenty of copies, so be sure to get one, read it and think this weekend about all the brave men and women who have fought and died to protect our right to, among many other things, read freely what we like. One more thing--I'm uploading a video that fits the spirit of this weekend. This is a scene from Henry V by Shakespeare. Now don't freak out on me, guys!! Shakespeare is very cool and this is a great scene. Henry and his English troops are about to fight the French at Agincourt. The English troops are badly outnumbered and Henry's cousin, Westmoreland, comments on it. Henry says, basically, "That's good. I wouldn't want one man more! Those who live through this fight will have enough glory to last until the end of time. Those who don't have the stomach for this fight can go home now and I'll give them the money to get back. But those who live through the day will celebrate this day (St. Crispin's day) the rest of their lives, even when they're old. They'll show their scars and tell what the story of what happened. Any man who stays with me is my brother, no matter how poor you are." This really sums up the spirit of Memorial Day--remembering the bravery of those who fought in the past and, as in Heart of a Shepherd, more recent years. And guess what--England won at Agincourt! And World War II. Kids everywhere like the Who Was...biographies. I can tell because we can never keep them on our shelves here at the library. And there are good reasons behind that--the books are interesting, informative and make good quick reads. Plus the writers really know how to move the stories along and keep a reader hooked until the last page. 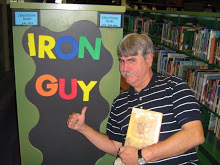 Today the Iron Guy will tell you about a Who Was.. biography and three other books published by the same company. And what stories they tell!! Epic lives and epic struggles. Building magnificent structures under impossible conditions. Conquest, assassination, deadly diseases, endurance, heroism and dictatorship--all here in these terrific books! The first is Who Was Julius Caesar? by Nico Medina and it starts off with a terrific story. When he was twenty-five, Julius Caesar, sailing from Rome to Crete, was captured by pirates, who intended to hold him for ransom. Did he he cry out in fear? Plead for his freedom? No, he laughed in their faces and told them he was worth more than twice the ransom they asked! Furthermore, he wasn't afraid of what they'd do to him; he thought about what he would do to them when he got free--and he did! Julius Caesar was inspired by Alexander the Great and tried to accomplish great things--and he did! He became governor of many provinces, spent ten years conquering new territories for Rome, and eventually was the most important man in Rome. And he became Rome's first permanent dictator. He carried many good projects but did he love power too much? Especially as permanent dictator? What finally happened to him? You'll have to read this book to find out! But when you do, you'll see why Julius Caesar and his story dominated the ancient world and still casts its shadow to this very day. Then we have three books (Where is the Great Wall? by Patricia Brennan Demuth, Where is the Brooklyn Bridge? by Megan Stine and What is the Panama Canal? by Janet B. Pascal) that are related because they are about huge structures built with old technology that, incredibly, are still in use today. It's amazing that these things ever got built. People had to build on tops of mountains, under and over rivers and through dense, hot, steamy, disease-infected jungles. Brilliant people had to figure out, sometimes from scratch, how to build where no one ever attempted such things before, how to solve problems that no one had ever encountered and cure diseases that no one knew how to deal with. People worked long and hard on these structures for years and sometimes died--from yellow fever in Panama, from "the bends" on the Brooklyn Bridge or from just plain being worked to death on the Great Wall. But, in spite of all these obstacles, the work persisted and the projects were completed. We have the results of all that determination today in the Great Wall, the only human structure visible from space, and the Brooklyn Bridge and the Panama Canal, which are not only still used but still marveled at by thousands of people every year. And what larger-than-life personalities you meet in these books! Emperor Qin, the first emperor of a united China (believe me, you would not want him to be your boss! ), Washington Roebling, who helped put out a fire in the "cassions," the underground foundations of the Brooklyn Bridge and ruined his health, his brilliant wife Emily, who ran the building of the bridge for many years, Ferdinand De Lesseps, the Frenchman who had built the Suez Canal and was certain he could build the Panama Canal (he was wrong!) and, of course, Theodore Roosevelt, one of the most colorful presidents this country ever had. All four of these books tell the amazing stories of amazing people. You will definitely want to read these, guys! As I said, the writers know how to make the stories move and you will turn page after page to see what will happen. In addition, there are good timelines at the back of each book and bibliographies that lead to more books about these subjects. How could you lose, guys? Check these out and read these terrific stories. UPDATE--today is Nonfiction Monday. Be sure to take a look and see what other cool nonfiction books people are reading. What's this? Two reviews in one week? The Iron Guy has been doing some heavy lifting with his reading and reviewing lately! But I had really wanted to get something in for May the Fourth and I had also mentioned a couple of weeks ago that I had been reading this book. It's about time I finished it, don't you think? Anyway, I ramble. Let me clue you in to this really good sci-fi adventure story, Secrets of the Dragon Tombs by Patrick Samphire. The year is 1816. 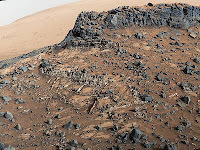 Humanity, especially the British Empire, has colonized Mars. Young Edward Sullivan wants to be like W. A. Masters, the spy and adventurer he reads about every month in his favorite magazine, Thrilling Martian Tales. Yet adventure comes all too quickly when the famous Sir Titus Dane visits the Sullivan house. It turns out that he's there for more than a social call; he is looking for a map for a hidden Dragon Tomb, one of the places where the Ancient Martians buried their emperors and left all sorts of advanced technology. He hopes to claim the technology for himself and maybe even sell some to the Emperor Napoleon, who is winning his wars on Earth. Sir Titus finds the map but needs someone to decipher the Ancient Martian inscriptions that tell where the Tomb is located. That someone is Edward's father, a brilliant scientist and inventor who has created a sort of computer. Sir Titus kidnaps the father and the rest of the family, hoping to force Edward's father into solving the puzzle but Edward, two sisters and his blathering idiot cousin Freddie escape. How could this assortment of kids ever hope to rescue their family from such a powerful bad guy? And is there more to Freddie than what you see on the surface? And if they ever find Sir Titus, will it be too late? One more thing--and you can ignore this part if you want--I've got a question for all you boys. I'm very curious about this. As I said, this book draws on a lot of old books. Like the John Carter of Mars books written by Edgar Rice Burroughs (author of the original Tarzan) in the 1910's. In these books, the climate and atmosphere of Mars wasn't that much different from Earth's. When I was 16, I read Ray Bradbury's The Martian Chronicles, one of the most terrific books ever, in which human beings walked and drove around Mars like the were in their own neighborhoods on Earth. Once I reviewed a sci-fi book (Space Cadet by Robert Heinlein) written in the 1950's in which a bunch of cadets crash-landed on Venus and had adventures there. We were willing to accept these ideas (even if suspected they weren't accurate) because no one had explored those planets. Since those days, we've sent up several satellites and rovers that have actually gone to these planets and beamed back images of what Mars and Venus are truly like. Now we know that Mars is a barren rock and Venus has a pressure-cooker atmosphere that disintegrates spacecraft before they reach the surface. So let me ask--would any of this current knowledge interfere with your enjoying a story like Secrets of the Dragon Tombs? You boys have grown up seeing pictures from the rovers and knowing the true conditions of Mars. Could you just sit back and enjoy the story or would you say, "Oh, man, Mars isn't like that!" I had no problem with it but I'm from another generation, growing up reading those older books but what about YOU? Leave me an answer in the Comments section under this post and let me know. Greetings, guys and guess what day it is? Come on, you'll never guess! Come on, I bet you'll never guess in a hundred...Wait a minute, that thing off to the left might give you a clue. Of course today is May 4 and it's STAR WARS Day! What a great day. Every guy I know loves Star Wars. And wasn't The Force Awakens a terrific movie? You bet! Well, there are so many Star Wars books and graphic novels out there that we could probably fill an Imperial Battle Cruiser with them but I'm going to tell you about only one--a good SW graphic novel. It's Star Wars: The Original Trilogy by---well, it's by a lot of artists but the manuscript adaptation is by Alessandro Ferrari. 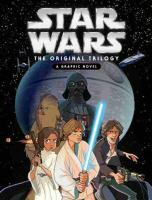 This graphic novel covers all three of the original movies--A New Hope, The Empire Strikes Back and The Return of the Jedi. I won't summarize the story because just about everyone knows it--and probably knows it by heart! This graphic novel does it justice. The artwork and the story stay true to the movies, unfolding scene by scene and even line by line from the originals. And, yes, all the excitement, the battles, the high-speed chases, the incredible interiors of space ships, and the cosmic drama of Luke, Vader and the Emperor are here. The artwork is first-class and, as I said, the writing stays close to the original story, which hardly needs any improving. Anyone who enjoyed those original three movies will enjoy this. Now, this graphic novel isn't perfect. In fact, it had one major flaw that didn't ruin it for me but kept me from enjoying as much as I could have. You can see it (sort of) on the picture of the book's cover. Look at the way they drew Luke, Leia and Han. You see those big eyes on Luke and Leia? And that long chin on Han Solo? It makes them look too cartoonish. At least it did for me. It may not bother you. In any case, however, don't let that stop you from checking this out. It's really good. I liked it. You will too. The Iron Guy says, "Read it you should. Enjoy it you will."